Uncompressed HDMI Out? Canon announced a new firmware update available in April 2013 that provides uncompressed HDMI output and improved AF Performance. 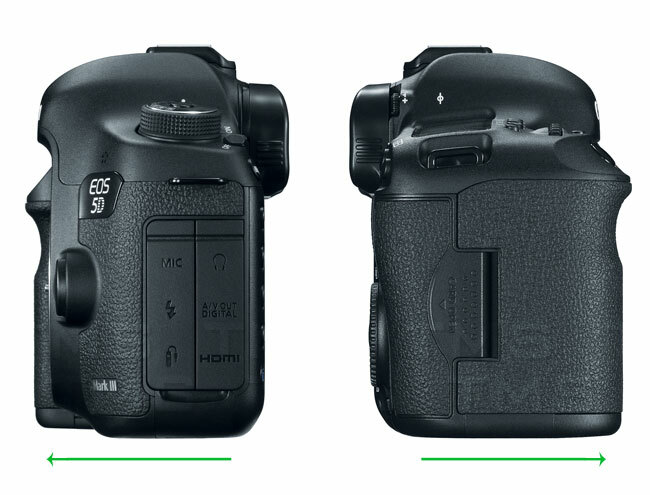 When shooting video, HDMI Output makes possible the recording of high definition uncompressed video data (YCbCr 4:2:2, 8 bit) from the EOS 5D Mark III to an external recorder via the camera's HDMI terminal. This, in turn, facilitates the editing of video data with minimal image degradation for greater on-site workflow efficiency during motion picture and video productions. Additionally, video being captured can be displayed on an external monitor, enabling real-time on-site monitoring of high-definition video during shooting. Ideal for wildlife photographers and others who often use Canon EF super-telephoto lenses with extenders, the new firmware allows cross-type autofocusing with the center AF point when the maximum aperture becomes as small as f/8. This new feature greatly expands the range of EF lens/extender combinations that support autofocus when used with the EOS 5D Mark III. Add a battery! Need an extra battery? Add a Lenmar DLCE6 to your cart! 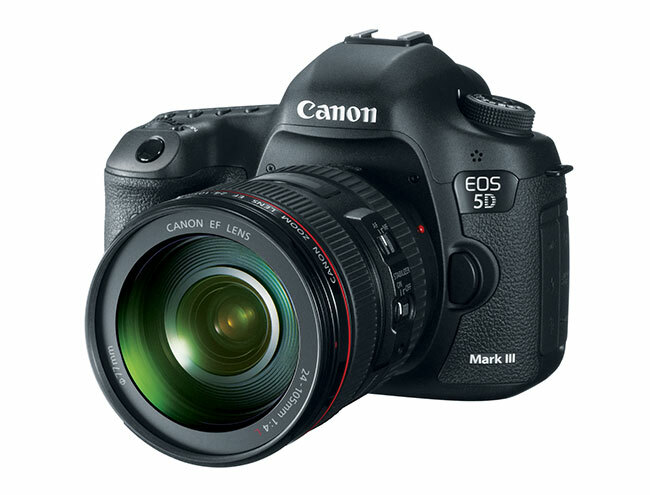 The Canon EOS 5D Mark III Digital Camera Kit with Canon 24-105mm f/4L IS USM AF Lens. With supercharged EOS performance and stunning full frame, high-resolution image capture, the EOS 5D Mark III is designed to perform. Special optical technologies like the 61-Point High Density Reticular AF and an extended ISO range of 100-25600 (expandable to 50 (L), 51200 (H1) and 102400 (H2) make the EOS 5D Mark III ideal for shooting weddings in the studio or out in the field, and great for still photography. Advanced professional-level high definition video capabilities (that includes a host of industry-standard recording protocols and enhanced performance) make it possible to capture beautiful cinematic movies in EOS HD quality. A newly designed 22.3 Megapixel full-frame Canon CMOS sensor, Canon DIGIC 5+ Image Processor, and shooting performance up to 6.0 fps provide exceptional clarity and sharpness, even when capturing rapidly-unfolding scenes. 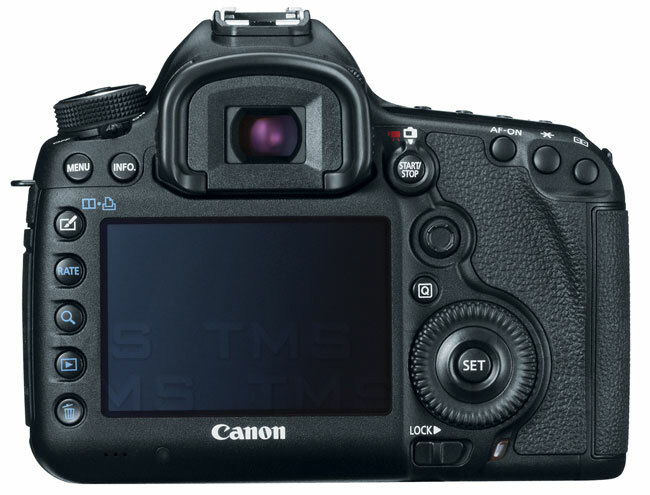 Additional technological advancements include an Intelligent Viewfinder, Canon's advanced iFCL metering system, High Dynamic Range (HDR), and Multiple Exposure mode — all of which that help make the EOS 5D Mark III the perfect multimedia tool. The EOS 5D Mark III features a newly developed Canon full-frame 22.3 Megapixel CMOS sensor that’s designed from the ground up to create high resolution, perfectly detailed images with unprecedented speed and clarity. A full 24 x 36mm, the sensor captures 5784 x 3861 large individual 6.25 µm pixels and has a much-improved S/N ratio resulting in better images from the start. A new photodiode structure with an increased photoelectric conversion rate increases the sensor's sensitivity by approximately 2 stops over previous models, meaning higher ISOs with the lowest noise of any EOS digital camera. And a 2-line 8-channel simultaneous signal readout means speeds of up to 6.0 fps (RAW + JPEG) are possible!